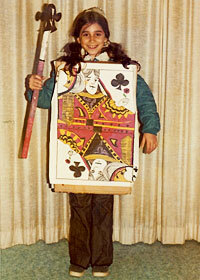 The "Queen of Clubs" in the "Deck of Cards" costume I created one Halloween. I entered a costume contest and won a stuffed, green alligator! I was born in Madison, Wisconsin, where my parents met during graduate school. I grew up on the East Coast. I attended Georgetown University Law Center and practiced law in Washington, DC and Chicago, Illinois. After, my family and I lived in the Pacific Northwest for ten years – with the funniest cat and the sweetest dog - before moving to beautiful Northern California. Writing has always been a passion. I've written stories since I was a teen and publishing those stories was one of my greatest dreams. I was most influenced to write by my mother. I love writing stories for children. BEFORE YOU WERE HERE, MI AMOR (Viking, 2009) was inspired by the birth of my sister's first child. THE CAZUELA THAT THE FARM MAIDEN STIRRED (Charlesbridge, 2011) popped into my head while I was cooking. I was inspired to write ALPHABET TRUCKS (Charlesbridge, 2013), after watching a zipper truck along a highway. ALPHABET TRAINS (Charlesbridge, 2015) and ALPHABET BOATS (2018) are companion books in the alphabet transportation series. Six favorites (there are many more) include "Watership Down" by Richard Adams, "Lonesome Dove" by Larry McMurtry, "The Power of One" by Bryce Courtenay, "A Confederacy of Dunces" by John Kennedy Toole, "The Bear Went Over the Mountain" by William Kotzwinkle, and "The Time Traveler's Wife" by Audrey Niffenegger. Some children's favorites include "Dinner at the Panda Palace" by Stephanie Calmenson, "One Hungry Monster" by Susan Heyboer O'Keefe, "Agent A to Agent Z" by Andy Rash, "Brave Irene" by William Steig, "The Little Prince" by Antoine de Saint-Exupéry, "The Graveyard Book" by Neil Gaiman, "Okay for Now" by Gary D. Schmidt, and the "Harry Potter" series by J.K. Rowling.